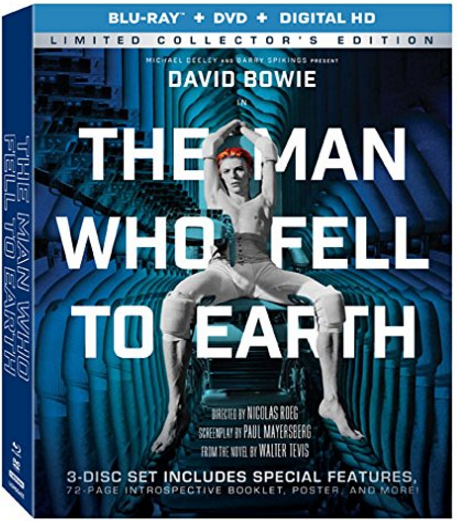 The three-disc Studiocanal/Lionsgate Limited Collector's Edition box set of the SF cult classic "The Man Who Fell to Earth," starring David Bowie in his first leading film role, includes several new extras along with a booklet, four art cards, a fold-open sheet of production notes and a mini poster. Although the now out-of-print 2005 Criterion Collection edition was more impressive, if only because it offered a commentary track featuring Bowie (along with director Nicolas Roeg and actor Buck Henry) among its bonuses, there's plenty of fascinating behind-the-scenes material here. The intriguingly told if suspension-of-disbelief-straining film portrays orange-haired alien Thomas Jerome Newton (Bowie, perfectly cast as a tragically fragile stranger in a strange land) who hopes to fund a rescue mission to his dying planet with profits from his advanced technology. Candy Clark is a naïve small-towner who insists on trying to love him, Rip Torn is a lecherous college professor hired to help the mission get off the ground and Buck Henry is the head of Newton's eventually too-big-to-be-tolerated corporation. Instead of a conventional sci-fi adventure, the film is a depressing and often unsettling allegory about how the real world (ours, that is) will distrust and attempt to crush an idealist outsider. The beautifully restored 1976 film and all bonus content on the single Blu-ray disc are duplicated on the set's two DVDs. A gum-chewing Bowie appears in a 1977 French TV interview that's made slightly awkward by the host's constant running translations of his English questions (such as "Will you change careers?" and "Will you change your face again?") and Bowie's tolerantly amused answers. Then 30 years old and residing in Switzerland, Bowie notes that he wants to live two years in different countries for the rest of his life (which didn't happen), and that a biography of expressionist painter Egon Schiele will be his next film (it was never made). About his music, he says, "It seems I'm singing less on my albums, because I don't think I have anything to say anymore," and incorrectly predicts "a lot of instrumental things from now on, I think rather like the last album ('Low') but even moreso." More recent (although unfortunately undated) cast-and-crew interviews are with director Roeg; screenwriter Paul Mayersberg, who adapted the Walter Tevis novel; actress Candy Clark; producer Michael Deeley; cinematographer Tony Richmond; costume designer May Routh; and stills photographer David James. All offer interesting making-of tidbits that make watching them worthwhile. Roeg and Mayersberg both point out that seeing Bowie in the BBC documentary "Cracked Actor" convinced them that he was their man-who-fell. Mayersberg says that Peter O'Toole was considered for the role but never approached, and that Bowie did everything "immaculately." Richmond recalls that when Bowie demanded no pig's blood be used in a scene, Richmond donated some of his own instead, a solution that Bowie apparently found acceptable. He also reveals that Roeg used neither storyboards nor a shot list when making the film. An interview with Sam Taylor-Johnson, a director who had nothing to do with this movie and who only offers her thoughts as a fan, is completely superfluous. Strangely, the set's photo-filled 72-page booklet, the four "art cards," a 16-page fold-open sheet of production notes and the folded mini-poster are so small that they come nested in a cardboard tray that's not as big as the plastic case for the three discs. Everything fits in a slot that's only 5.75 x 4.5 inches, and the poster unfolds to 19.25 x 13.25 inches. 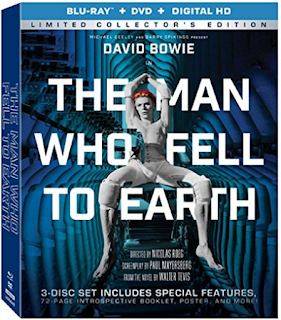 The Man Who Fell to Earth: Limited Collector's Edition has a retail list price of $34.99 and will be released January 24, 2017.